A Day Late and A Dollar Short: Bonefish Grill - Happier Hours - **FREE** Food! 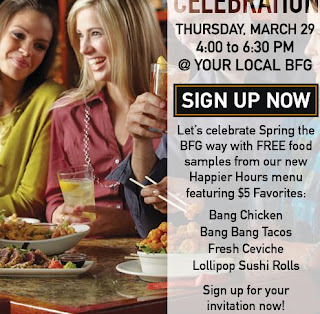 Bonefish Grill - Happier Hours - **FREE** Food! Stop by your local Bonefish Grill ("BFG") on Thursday, March 29, from 4PM-6:30PM and celebrate Spring! Visit the BFG facebook page to see how you can sign up for your invitation to try **FREE** samples from their new Happier Hours menu!